Move over pumpkin and pecans, it's time to give cranberries their fifteen minutes of fame. You know me and how I get on kicks. Well, the next kick I'm going on is a cranberry kick. I've got big plans for everything from cranberry orange muffins, to sugared cranberries, to cranberry curd. But first things first. These cranberry orange muffins. To be honest, I didn't quite know if I would like the dried cranberries in the muffin. While they work great in a flaky scone or a crumbly cookie, would they work in a soft muffin? So I have made a lot of muffins around these parts, so I won't bore you with the basics. But I will share one quick tip I use to measure my liquid ingredients. In a lot of muffin or quick bread recipes, I am mixing together a true liquid (like milk) and a semi-solid (like sour cream or yogurt). Well, call me lazy but I don't want to have to clean another measure cup. What I do instead is pour liquid in to a liquid measuring up like you see above. Then I spoon in the yogurt or sour cream (or peanut butter, etc.) until the liquid is offset by the right amount. Ok, say I want to measure 1/2 cup milk and 1/4 cup sour cream. I pour 1/2 cup milk into the measuring cup, then I spoon in sour cream until the milk level rises to 3/4 cup (1/2 + 1/4 cup). After that, I add in the rest of my wet ingredients that don't require such sophisticated measuring, like the eggs and butter. 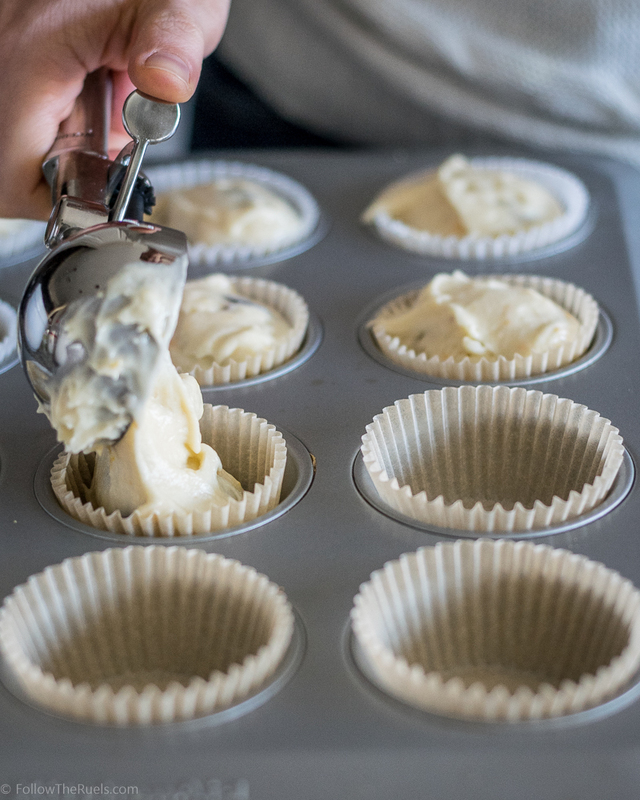 For these particular muffins, and any muffin to which I add zest, I mixed the zest in with the dry ingredients to that it becomes evenly dispersed throughout the batter. Then I pour in the wet ingredients and give it a few (emphasis on a few) good stirs. To much mixing and the muffins will be chewy, not soft. Another fun trick I use (Man, this post is just full of them, isn't it? ), is to portion out the batter into the individual tins using a ice cream scoop. Not only is it the perfect amount for 12 muffins, but it's just so much easier and quicker to use. Once they are out of the oven, I head straight for the muffin top. I know it's a cliche, but the muffin top is truly the best. I like to add a little bit of sugar to the tops of these muffins so that the top has a nice crust, but is still really soft inside. The combination of the orange and cranberry makes these muffins taste so fresh. The muffin itself is light and airy, so would make a great addition to a holiday breakfast to balance out all those other heavy foods we eat this time of the year. But, thanks to those dried cranberries, this muffin can be enjoyed year round, not just this Winter! Preheat oven to 350 degrees and line a muffin tin with muffin liners, then set aside. In a small bowl or large measuring up, mix together milk, sour cream, butter, egg, and vanilla. In a large bowl, mix together flour, sugar, baking powder, salt, and orange zest. Pour the wet ingredients into the dry, and mix together until flour is just barely incorporated. Fold in cranberries. Spoon about 1/4 cup batter into each muffin tin. Bake for 20 to 25 minutes, or until muffin tops turn slightly brown.